Stage 1 of this project is to set up a tapestry frame, with suggestions for using a picture frame or art shop stretcher frame. I decided to improvise using my four shaft table loom. In standard use it would look like this – a frame with a roller at the back to hold the warp, a roller at the front to hold the new cloth, a castle protruding up which has levers to select which shaft/s (and therefore warp ends) to lift, and a beater/reed assembly that spaces the warp ends and is used to push each new pick of weft into place (hard to see in this photo). The photo is from a 5-feb-2010 post. 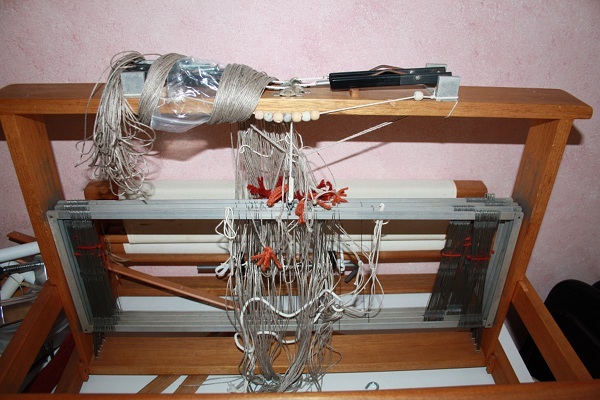 The loom was in a bit of a mess. The warp left over from a class last year with Jason Collingwood (post 23-Apr-2011) was still threaded and wrapped around the castle. The castle/shaft assembly simply lifts out of the frame, so that wasn’t a problem – but I couldn’t bear to waste that beautiful linen warp. It’s not the cotton suggested in the course notes, but it seemed a reasonable substitute. This is the end arrangement. The linen warp I was “saving” wasn’t a continuous length. Instead of wrapping the frame as suggested in the course notes, I wound onto the warp beam and lashed onto the cloth beam as I would normally, but with castle and beater taken out of the frame. I used a shed stick and heading cord as in the notes, plus a heddle rod and continuous string heddles. 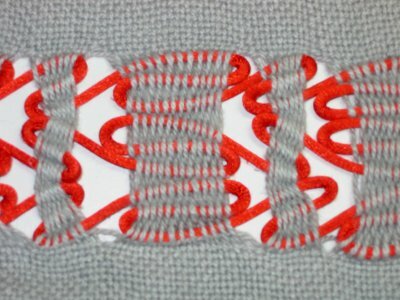 That last part stung me – I didn’t cross-check on my memory, and didn’t set it up properly – there’s a really nice tutorial with photos and video on this link, from Laverne Waddington’s incredibly informative blog backstrapweaving.wordpress.com. 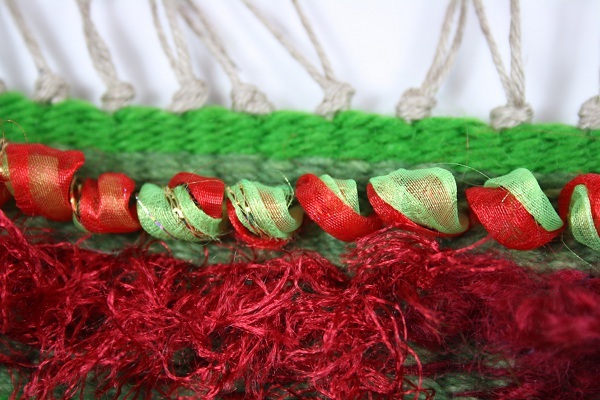 * an area of curved wefts in green, orange and a little red. 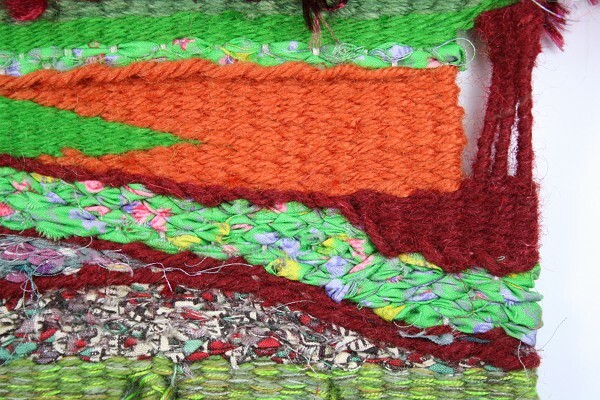 This involved weaving back and forward in small sections, creating shapes. The next section got hidden in the overall photo. The weft is torn strips of cotton fabric, first in a couple of curved areas to get back to a straight fell line, then some plain weave. I love the way the pattern crushes up. Next two picks of rug wool to firm things up, a row of soumak in the fabric, two more picks of rug wool and a row of soumak back in the other direction. It looks a bit like a plait laid on top of the tapestry. I like it very much. There’s pattern and texture and it looks somehow sturdy and self-contained, while also decorative and fun. This wall of ghiordes knots is what hides the cotton fabric. 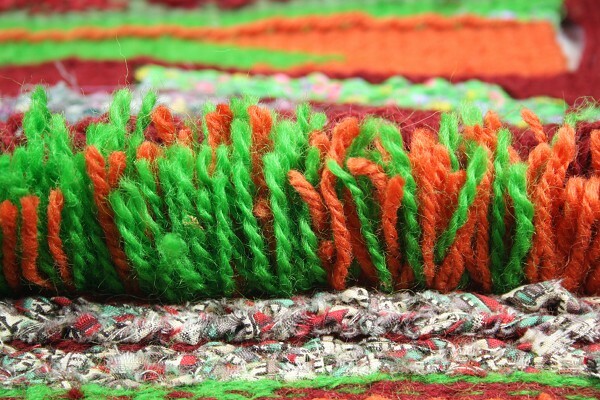 Each knot is four lengths of rug wool, so eight cut ends or tufts, which is pretty bulky and assertive. I tried to get a graduation from orange to green across the width. I haven’t trimmed the ends so they are rather wild and uneven. That’s my default preference, unless there is a specific purpose or requirement that a more structured, formal line of knots would suit. After a couple of stabilising picks of plain weave I tried a row of continuous ghiordes knots, this time four strands of the red rug wool. It’s interesting that some of the loops sit a bit differently. I think I may have twisted the strands together a bit at some points, while at others they were sitting side by side in the knot. That could be a real trap in a larger piece, depending on the effect you want. 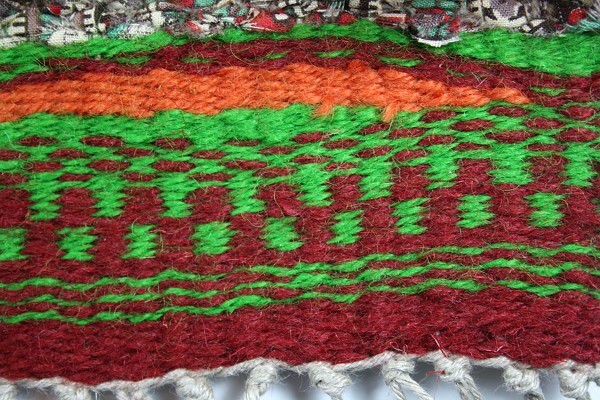 In this photo across the weaving you can see the actual green/orange knots at the base. It could be interesting to play with this, changing the side where the knot sits – either in single row of knots or in repeated rows. This section is so much nicer in person. I bundled together 10 or 12 fine threads, all different reds. There’s some wool, 2 ply and singles, cottons and lots of anonymous bits. 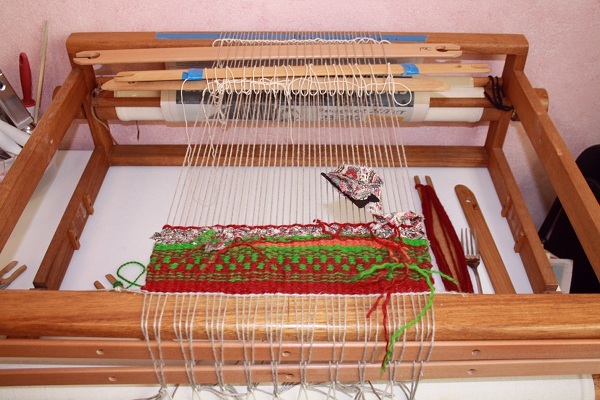 I tried soumak over four threads, at first over the full width of the weaving then in discontinuous areas. 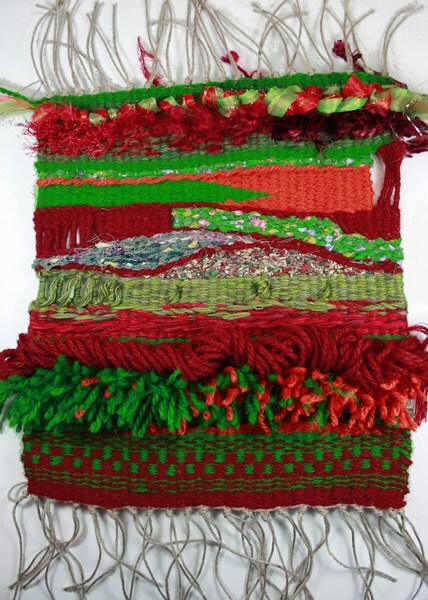 I introduced a green bundle of threads, mixed in amongst the red. 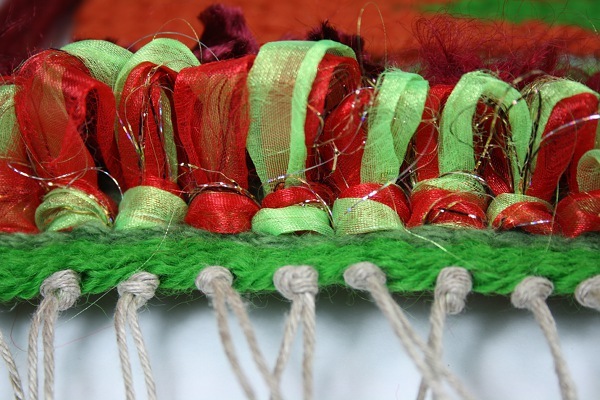 For some additional variety I used a mixture of soumak over two threads and over four threads. The mix of different colours in each bundle, some matt wool, some shiny mercerised cotton, gives a really lively, glowing effect. The relief texture produced by the soumak also adds interest and variety. I can see this being used in ocean colours to suggest ruffled water. Depending on proportions and colour choice it could be a background foil providing quiet interest, or an intense focal point. Here I went away from the course requirements, on my own little adventure. On the right in the green is a slit in the plain weave where I wove in sections rather than back and forward over the entire width. Instead of neatly starting fresh at the bottom of each section I just carried the weft yarn down from the top of the previous section. Possibly a useful effect – some deeper shadow or even a gap from the slit, and the vertical instead of horizontal line of the yarn (good to have the variation in colour to enhance that). One could also use the loop of yarn to attach… something. On the left is a more extreme experiment. 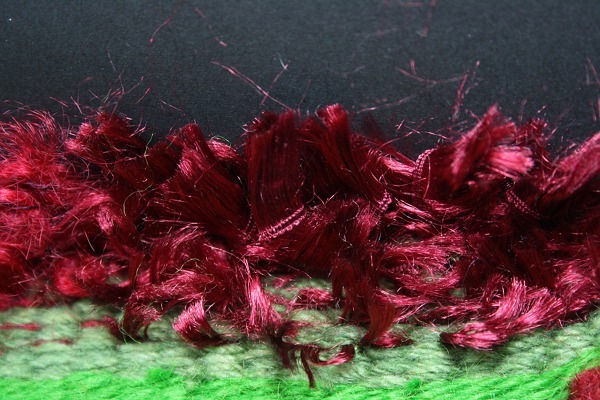 I’ve been fascinated by the yarn wrapping in Sheila Hicks’ work. Follow this link and scroll down to Zapallar to see what I mean (an aside – I just found that link, from the Mint Museum in Charlotte, NC, and I so, so, so much wish I could visit there). Assuming most people don’t click through, as a poor substitute I’ve included a shot from my sketchbook, based on Hicks’ work. On this first attempt at wrapping I continued with carrying down thread from the previous column. It gives a variation in texture, but is a bit distracting and confusing visually. Some latter attempts in the sampler work better. While I’m off-track, I’ll add that this carry-down idea was based on spanish lace. The red/grey example is from August-2008. I’m pretty sure there is some of this in Anni Albers piece that I looked at yesterday. All to me very interesting, and another great way to add movement and space and variety to what is basically plain weave, but definitely out of scope for this project. This next section is mostly variations of previous techniques. There are curved or eccentric wefts, this time in a variety of fabrics. I outlined each area with a row of soumak in rug wool. I really like weaving with fabric strips, but in this weft-faced tapestry I found it difficult to beat it down enough to cover the warp. The rug wool knots are nice and firm and keep things packed down. It also gives some nice definition to the shapes I was forming. 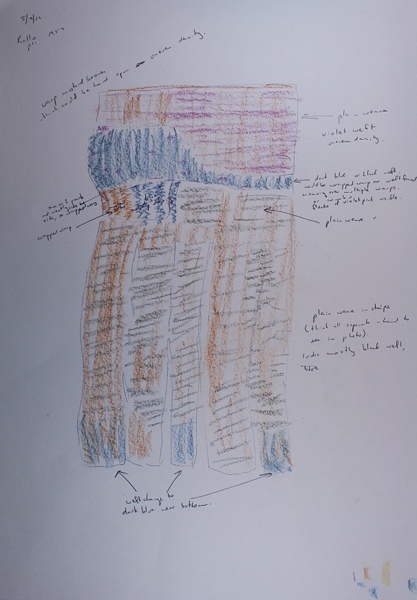 While working I was thinking of rock strata – with the right fabric choice this could work really well. On the right of the photo you can see another version of the wrapped warps. I love the possibilities for playing with horizontal and vertical, and dense areas with space. The row of orange soumak towards the top gives some lovely shadow and a little height. This was done over four warp threads, perhaps with a slightly looser tension, and give quite a different effect to the over-two-threads red below. 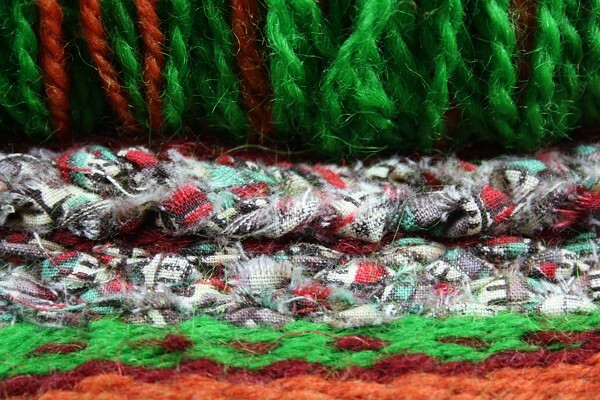 The relatively smooth weaving in wool around it, rather than the textured fabric, also adds to the effect. The sharp angle of green meeting orange is another off-project technique. It’s clasped or interlocking wefts. 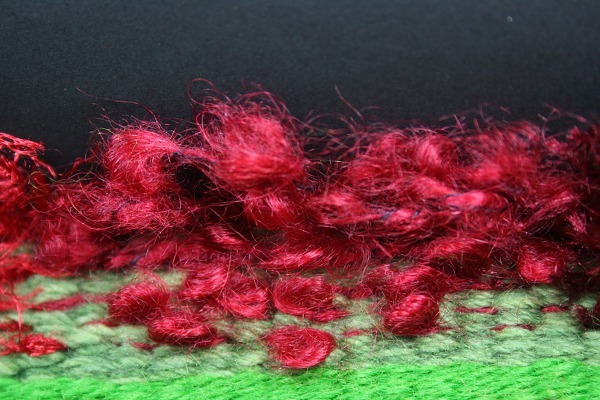 Kaz Madigan (curiousweaver.id.au) has some nice photos on how to do it here and a video tutorial here. There are also diagrams of some alternative versions in Albers’ book. These three thumbnails show my attempt to experiment with fancy yarns. 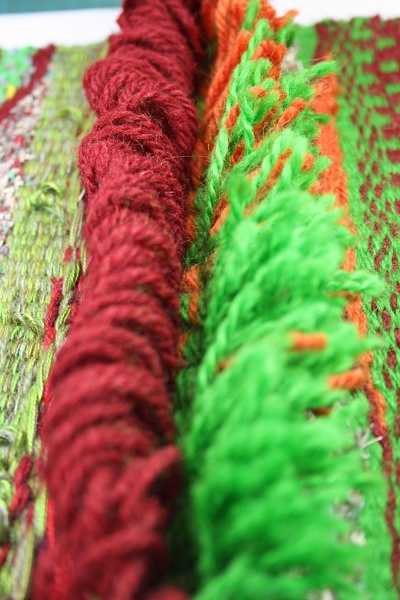 They are side by side near the top of the weaving. 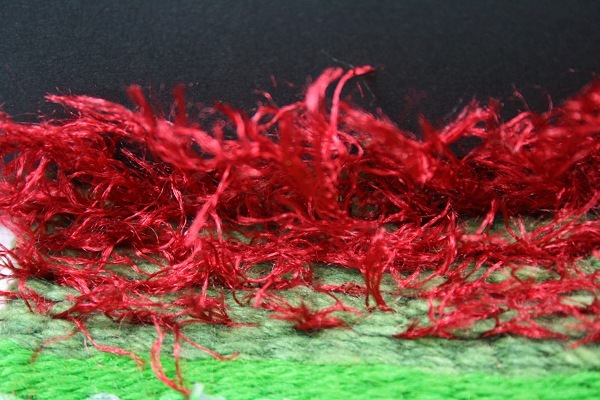 I’ve heard/read somewhere that fancy yarns are more effective if given some space – you see move of the texture if it’s contrasted to areas of non-texture. So with each yarn I first did single picks to get dots of colour and texture surrounded by green, then two picks in a row to get a line, then a row of soumak to get a heavy, raised line, then a row of continuous (uncut) ghiordes knots to get still more height and yarn showing. Clearly I didn’t leave enough open space around each section. In the photos it’s just a muddled mass/mess. Fortunately it’s possible when holding the sampler in your hands to cover up the surrounding bits and concentrate on a particular section, so it is still usable. The effects achieved are definitely different, and as always which you would choose to use depends of what you’re trying to do. My final experiment used a more complex fabric and thread combination. I’ve enjoyed the height and springy-ness of organza in previous work in the course. This variation has two colours of synthetic organza. It looked a little dull and I was concerned that the colours might blend into blah while weaving, so I added some sparkle with four different metallic threads, everything wound together on a small stick shuttle. The first section is continuous, uncut ghiordes knots, since I thought that would give the space and height to really show off the organza’s oomph. In my eyes it worked well in a rather cheap-and-cheerful way. I’m thinking sunshine and sea-side rock (the boiled sugar confectionery). Partway through I realised I hadn’t created enough “yarn” for a full row of ghiordes knots, so I finished with some simple loops. 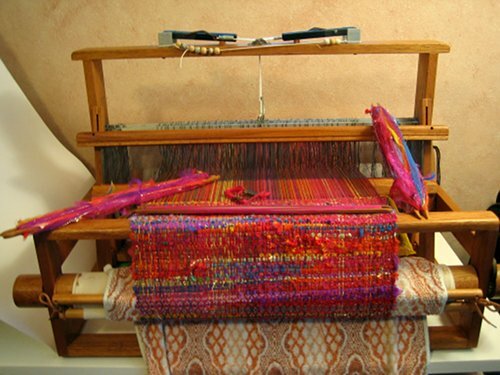 To do this you weave a pick, then with the shed still open use a knitting needle to pick up a loop of yarn each place the weft sits over the warp, then close the shed and beat gently with the knitting needle still in place supporting the loops. Obviously it’s all pretty unstable – there are no knots to keep the loops in place – so keep the knitting needle there for the next few picks and beat them down firmly. Different size needles will give different size loops, and of course you don’t have to pick up at every point – you could have a line that stops and starts or trails off…… ….. .. . . . .
After all the above I’m reasonably happy with this sampler. I didn’t use a huge variety of wefts – that’s in the next stage. I think I stayed true to the general thrust of the project requirements, with just a few variations and additions that I learnt in “normal” (to me) weaving but that make sense in tapestry. Some of them worked (the final wrapped columns), others not so much (the spanish lace variants). I just need to keep pushing. Albers, A., (1965) On Weaving. Dover edition published 2003, an unabridged reproduction ed. Middletown, Conn.: Wesleyan University Press. Very interesting work! I could feel my mind stretching in a few places. I feel like I need to comeback to this post a few times,just ti make sure the ideas “stick”. I liked the wrapped warps effect and I obviously need to follow the links on clasped warps. 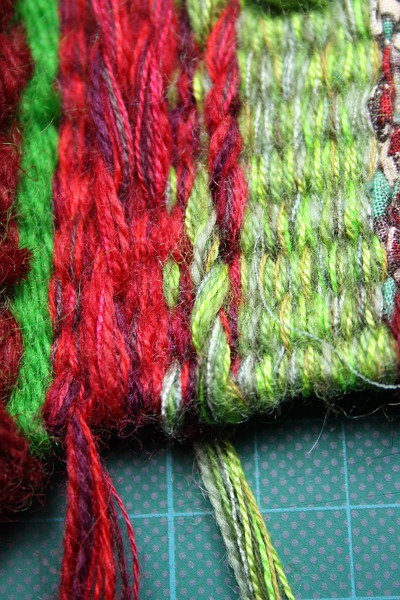 So many things to try – this is why weaving never gets dull. 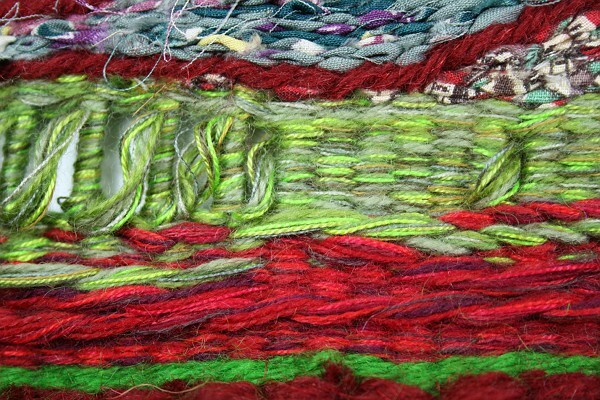 I find weaving endlessly intriguing – so many possibilities and combinations. There’s nothing simple or limiting about plain weave and a few knots. Of course you have so many other textile interests to cycle through – always something new, always something fun to return to.